What will Xi mean for Tibet? Written by: Alison Reynolds, Executive Director, International Tibet Network. As China’s President-in-waiting Xi Jinping touches down on US soil, at the forefront of China’s abysmal human rights record is the current crisis in Tibet, where 21 monks, nuns and laypeople have set light to themselves, calling for freedom for Tibet and the return of the Dalai Lama. The US Administration has already stated that Tibet will be on its agenda. That is Good. In their public activities, Tibet campaign groups will certainly ensure Mr Xi is fully aware of popular support for the Tibetan people in this bastion of democracy. That is very good. But what do we actually know about Xi Jinping’s personal opinions on Tibet? 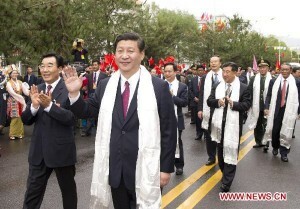 Chinese Vice President Xi Jinping (Front) as he arrives in Lhasa to 'celebrate' the '60th Anniversary of Tibet's Peaceful Liberation' on 17 July 2011. We know that in Lhasa last summer – where China’s Vice Presidents are sent every 10 years to mark the anniversary of China’s occupation – Xi didn’t put a foot out of line, vowing to “completely smash any plot to destroy stability in Tibet and jeopardize national unity”. But no-one can seriously have expected him to do anything on that occasion but stick to the script. Indeed, in these sensitive months leading up to the transition of power from the 4th to the 5th generation of Communist party leaders, it would be unthinkable that any of the leadership hopefuls will rock the boat. The media tells us that during this visit Xi Jinping will be presented with a photo album of his father’s travels in the United States in 1980. Xi Zhongxun, a former vice premier who died in 2002, was a revolutionary hero who was purged from the Communist Party in 1962 by Mao Zedong and detained for 16 years until he was rehabilitated in 1978 by Deng Xiaoping. Xi Zhongxun is a figure of considerable interest to advocates for Tibet; he was close to the 10th Panchen Lama (whom he described in a People’s Daily eulogy as “a markedly great leader of Tibetan Buddhism”) and also met the Dalai Lama. In the 1980s, when Tibetan envoys visited China, Xi Zhongxun was wearing a treasured gold watch, given by the Dalai Lama many years previously. Xi Zhongxun finally fell from favour for a second time after the Tiananmen Square protests, when he supported Hu Yaobang’s objections to the use of force against demonstrators. So the big question for Tibet campaigners is this – will Xi Jinping turn out to be his father’s son? Has he inherited any empathy for the Tibetan people at all? 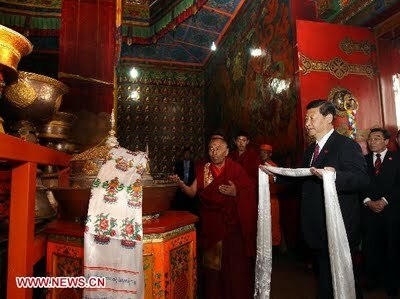 Xi Jinping at Tashi Lhunpo Monastery, the seat of the Panchen Lama. The information we have about Xi’s relationship with his father is confusing and tantalising. Melinda Liu, writing in Newsweek, described the astonishment of Chinese interpreters as Xi candidly admitted to US Vice President Biden recently that his father and relatives had suffered during China’s Cultural Revolution. Twenty years ago Lena Sun in the Washington Post described a similar incident when Xi, speaking with ‘a trace of bitterness’ about being locked up as a teenager forced to read out denunciations of his father’s ‘crimes’ told her, “Even if you don’t understand, you are forced to understand…. “It makes you mature earlier.” Yet this is a man who joined the CCP during his father’s detention, deciding to become “redder than red” according to a childhood friend. And he is married to a PLA Major General, the singer Peng Liyuan, who likes to sing red songs about Tibet. Xi Jinping’s demeanour when he presented with the photo album of his father’s travels might tell us something, but then again this practiced politician, who knows the photo album is coming and will be keen to secure his succession, will no doubt have rehearsed a suitably inscrutable expression.